You can reach Chernogolovka from one of the Moscow airports by following the instructions below. However, we recommend this only if you speak Russian. All international participants will be met at the airports upon arrival. Please, let us know your flight details, if you have not already done so. To reach Moscow from one of the airports (Sheremetyevo, Domodedovo, Vnukovo) you can take an Aeroexpress train to a terminal station next to a metro station (Belorusskaya, Paveletskaya, Kievskaya, respectively). Once you get to the Moscow metro, ride to the terminal station "Shchyolkovskaya" on the dark-blue line, North-East direction. At "Shchyolkovskaya" go to the bus station by taking the exit near the first (head) car: go upstairs and take the exit on the right-hand side, then climb the stairs on your left. 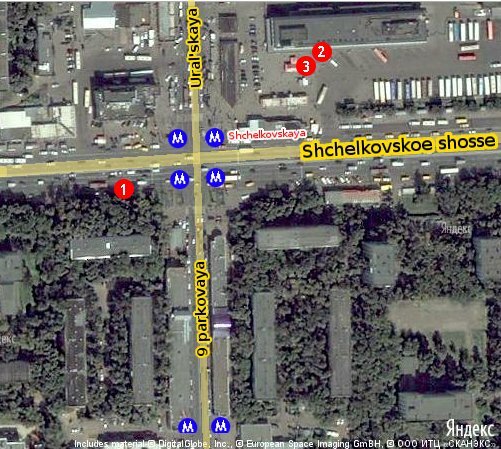 There is a large bus station near "Shchyolkovskaya". There you take an express bus 320 (Moscow-Chernogolovka) or 360 (Moscow-Dubrovo) to Chernogolovka. They depart from a platform close to the entrance to the bus station (point 2 on the map). The other choice is to take a minibus "Moscow-Chernogolovka" (point 3 on the map). In both cases you buy a ticket from the driver. It usually takes about 1 hour to get to Chernogolovka from "Shchyolkovskaya". If you want to take a taxi from the airport, go to the counter in the arrivals hall. Note that the ride to Chernogolovka (located near the town of Noginsk) can be rather expensive. The conference-related sites in Chernogolovka are shown on this map.